Being part of a luncheon is one of my favourite activities here. Not only am I able to taste different yummy foods cooked by my friends, but also can I be inspired by many new cooking ideas. Before going to Tokyo, I went to a luncheon. One of my best friends, Kitty cooked a big bowl of soup for us. We were so curious about what’s inside. She told us, in an as-a-matter-of-fact tone, that’s seafoods and tofu soup. For us, it sounds amazing because many of us have seldom tried this soup before. When the soup was served, it’s topped with some Japanese weeds, that made the soup look more appealing to our appetite. The seafoods were really fresh, going so well with the silky tofu. Only one word did I find to describe the soup, it’s “incredible”. Kitty told us the soup was very quick and easy to cook. The most important thing is that you have to use tasty chicken stock, not just water. Let it be cooked with some meat, like pork for some time beforehand. Now wonder the broth tasted heavenly. 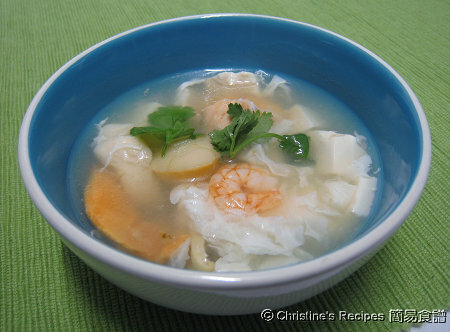 Whenever you want to serve this soup, you can add whatever seafoods you like, the soup can be done in 10 minutes. Rinse all seafoods and drain well. Mix salt, pepper and some cornflour for a while, rinse and drain again. I used Swanson Chicken Broth as my friend Kitty did as well, because it’s quite handy. Also you can add shredded pork or shredded chicken to add more meat flavours if you like. 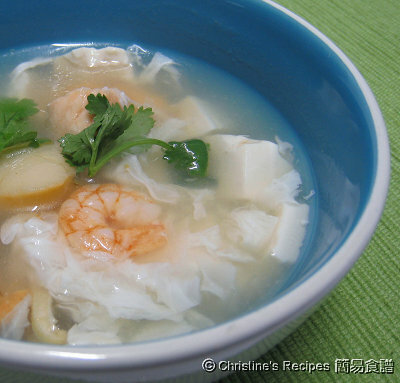 If you have dried scallops at home, pop in several of them to cook in the broth. The soup tastes even more delicious. simple soups are the best. I love clear broth soups. Thank you for sharing this recipe Christine. One of my 2010 resolutions is to eat healthier - this soup is one of the first things I am going to try! MMMMMM,...a simple yet so tasty & inviting soup! wow what a great recipe and gorgoeuous picture! This sounds so yummy and good. I have not heard of water chestnut powder and cannot wait to try. Easy and wonderful! Great picture! Christine, this is such a comforting soup! Looks delicious! This time of year soup is always welcome isn't it? That's a very simple and delicious soup for cold weather. Thanks for sharing. Happy New Year, Christine! Soup is always so comforting! Happy new year!